Our fully modular design allows us to create any type of solution to fit your specific space. Our dedicated AMH team will walk you through the entire process from beginning to end, ensuring your return and sorting processes will deliver the results you need! Our flex AMH™ solution can be used in libraries that use RFID, EM or barcode technologies. There is no need to convert your collection to a specific format in order to start taking advantages of efficient return & sorting processes at your library. Easily integrate the flex AMH™ system with any standard book drop. This allows users to quickly return multiple items and carry on with their day. These items will be separated and accurately processed in a fraction of the time it takes manually. 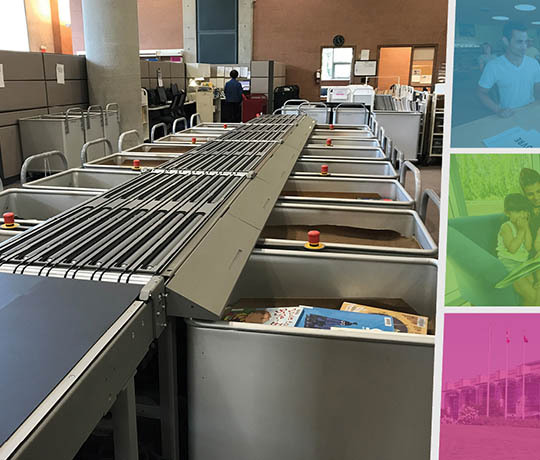 With extended conveyors and lift systems, the flex AMH™ system allows you to sort items from multiple rooms and floors within your library. By automating the collection of materials from many return points, you can simplify the complexity of getting items back on the shelf fast.manipulate it in any way you wish. Depending on your space and requirements, we offer a selection of return bins to choose from. We have a smaller, more square bin, a large rectangular bin, and our autoBin™ even senses the level of books in the bin and brings them all to the top for you, requiring less bending and repetitive motion injuries. For the ultimate ergonomic solution, we offer the flex stackingCart™, where books are sorted with their spines in an outward facing direction and stacked neatly onto the cart. These mobile stacking carts can easily be transferred into the stacks and with a touch of a button, transform into a horizontal shelf, making it convenient to re-shelf items.